After several successful runs at Thailand and the Philippines, International Peace Foundation is bringing 'Bridges', a dialogue series involving Nobel prize laureates, to Malaysia for the first time. 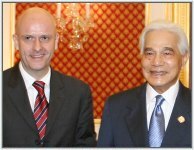 Lim chee Wah talks to Uwe Morawetz, founding chairman of IPF, to find out if peace really is attainable and why we should give it a chance. Too often the word ‘peace’ gets thrown around like a cliché. Politicians do it. Celebrities do it. And some of us still hold up the two-finger peace sign for a photo – drunk or not. But from November, the Vienna-based International Peace Foundation is staging a series of education-based events, known as ‘Bridges: Dialogues towards a Culture of Peace’, in Malaysia to change the way we look at peace. There is a fine line between peace and minding your own business. This is perhaps the basis for Bridges: to show that peace is not a passive state. And so with the patronage and participation of Nobel Laureates for Economics, Peace, Physics, Chemistry and Medicine, Bridges is organising more than 50 events over a duration of six months from now until April 2009 to stimulate intellectual, scientific and cultural exchange. Through a series of public lectures, seminars, workshops and dialogues hosted by local institutions, these Nobel laureates will facilitate and strengthen dialogues and communication between the various communities in our country and people from other parts of the world. Think of it as creating a common ground for people to exchange ideas and find a way to collaborate. Bridges believes that by enhancing science, technology and education as a basis for development, it could lead to a better cooperation for the advancement of peace, freedom and security in the region. But the icing in this unique approach to peace is the establishment of a working relationship between the laureates and local institutions that may result in shared research programmes and other collaborations. It a promising notion, and inspiring even, to have faith in the pen rather than the sword. 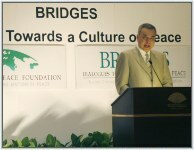 Bridges had been held successfully in Thailand since 2003 and in Philippines for the first time last year. For the Malaysian series, Bridges will deal with the theme of ‘building a culture of peace and development in a globalised world’, touching on issues pertaining to politics, economy, science, culture and the media. Uwe Morawetz, founding chairman of IPF, talks a little more about achieving peace through education. Education is a refreshing approach to promote peace rather than the usual pop culture fanfare. What inspired this? ‘Peace is a process which needs time, attention and the participation from all of us. With Bridges, we believe in the importance of education and the scientific community of Malaysia. And that is why we are bringing the knowledge and wisdom of Nobel Laureates to this country. ‘We are inviting them here not only to speak, but to share, engage and listen. They come here not for one day or one event only, but for various dialogues in different parts of the country – without requesting any honorarium because of their real interest in building bridges and because of their real interest in Malaysia. ‘We hope that this will not be the first and final visit from these Nobel Laureates but many more to come so that a long lasting friendship can be built with the local universities and schools, which hopefully leads to collaboration in research programs. This is how Bridges could develop into a long-term and sustainable success for Malaysia to strengthen education as a basis for peace. But is peace really attainable? ‘Increasing ethnic, political, religious and social conflicts, and the helplessness to respond to them show us that peace is not a given good. It has to be constantly learned, experienced and created anew. The International Peace Foundation has no concept for peace and no fixed solution how to achieve peace, but we believe that the first step towards peace is dialogue and the first step towards dialogue is respect. We believe that the interconnected problems of our world today cannot be solved only by politicians, business, scientists or religion individually, but by working together. In the Bridges event series people from all walks of life meet in a multidisciplinary program to find creative solutions to solve problems and achieve peace.